Tópico em 'Astronomia' iniciado por Rog 14 Set 2006 às 23:18. Depois de vários percalços com parafusos que desaparecem, está já encaixado e estendido o novo módulo de paineis solares, que irá duplicar a capacidade de energia da ISS (estação espacial internacional). Está concluida a 3ª saída dos astronautas da Atlantis na Estação Espacial Internacional. Os paineis agora colocados aumentam em cerca de 16 toneladas o peso da estação com os seus 73 metros, e aumentarão para o dobro a capacidade de energia electrica. Só serão ligados na próxima missão do Discovery em Dezembro, e darão energia electrica aos futuros laboratorios a serem encaixados (Europa e do Japão). This story was updated at 2:09 p.m. EDT. CAPE CANAVERAL, Fla. – NASA shuttle managers are deciding whether simple camera views, a third heat shield survey or possibly even a spacewalk may be required to address a mystery object near the space shuttle Atlantis that has already delayed the spacecraft’s planned Wednesday landing. The mystery object [image here], coupled with anticipated poor weather at the Shuttle Landing Facility here at NASA’s Kennedy Space Center during Atlantis’ initial 5:58 a.m. EDT (0958 GMT) arrival time tomorrow, prompted mission managers to forgo the attempt altogether to settle the issue, Hale said. Landing is now set for Thursday at 6:21 a.m. EDT (1021 GMT), NASA said, adding that the orbiter has enough supplies to last through Saturday. A press briefing featuring the heads of Atlantis’ STS-115 Mission Management Team is expected no earlier than 6:00 p.m. EDT (2200 GMT) with additional details. While the object’s appearance during Atlantis’ flight systems checkout – which astronauts have likened to “standing next to a howitzer” when the thrusters fire – and its relative motion near the shuttle suggest the two are the same, Hale cautioned that extreme reactions like a spacewalk or potential repair are at the far end of the list of possible responses. Atlantis’ STS-115 crew – commanded by veteran shuttle flyer Brent Jett – has already conducted two planned detailed inspections of their spacecraft’s heat shield that cleared its vital tiles and carbon composite panels of any concerns, first after launch, and then after about nine days in orbit. The second scan was completed on Monday. 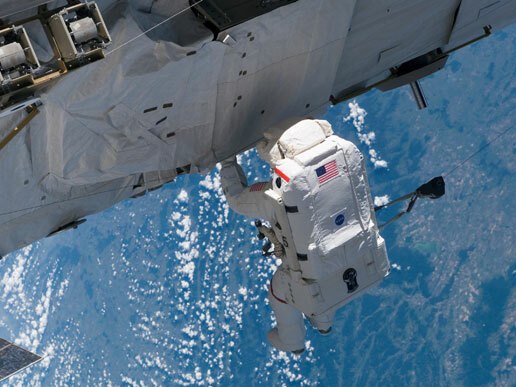 NASA’s STS-115 mission is the agency’s first to resume construction of the International Space Station (ISS) following two test flights to evaluate safety changes stemming from the 2003 Columbia accident. The shuttle delivered new solar arrays and massive trusses to the ISS early in its now 12-day spaceflight. Hale said that discovery of the mystery object – which cannot be identified in video because of poor resolution – came at an opportune moment when mission managers were ready to declare Atlantis fit for landing. Tuesday, just after the orbiter’s six-astronaut crew put their vehicle through a standard pre-landing shakedown to test thrusters, hydraulics and a number of other systems. “We shake the ship pretty good when we do this,” Hale said of the flight systems check, adding that a flight controller spotted a small object in Atlantis’ vicinity and backlit by the Earth about 15 minutes after the 2:30 a.m. EDT (0630 GMT) check today. Ensuring an orbiter’s heat shield integrity has been vital since the loss of Columbia’s seven-astronaut crew, since that orbiter’s heat shield was breached during launch by a piece of debris. Atlantis’ Sept. 9 launch, however, caused no such damage, and the heat shield was found to be in pristine shape after the Monday inspection, Hale said. A series of accelerometers, which recorded stresses or potential impacts along Atlantis’ wing leading edges did record about eight events around the time of the shuttle’s flight systems checkout, Hale said, adding that engineers are evaluating the data to determine its relevancy. The accelerometers also reported phantom signals during Atlantis’ liftoff, registering signals where no impacts were seen or damage found, Hale added. Atlantis’ STS-115 astronaut crew is slated to go to sleep at about 1:45 p.m. EDT (1645 GMT), and have already been told of the landing postponement. “Yeah, that is good news,” Jett, STS-115 commander, said. Mission controllers did ask the Atlantis astronauts to prime the shuttle’s robotic arm system to allow its “elbow” camera to be used in a video survey. Jett later reported the sighting of an object by STS-115 mission specialist Daniel Burbank, which the crew took photographs of as it drifted away. Engineers and mission planners will work through the afternoon to develop a plan for either additional surveys, inspections or other required work for the STS-115 crew, Hale said. That work could go on well into the crew’s evening, and potentially until Jett and his crewmates are scheduled to awake at 9:45 p.m. EDT (0145 Sept. 20 GMT) tonight for their next day of orbital work, he added. A Nave Atlantis já regressou e pousou em segurança na Florida. Depois de um objecto que encontraram ontem a flutuar perto da nave, os astronautas chegaram a ponderar se este poderia ter feito algum estrago na nave, mas tal não se veio a confirmar. Ontem também chegou à ISS a primeira turista Espacial, que viajou na nave Soyuz russa. Gastou cerca de $20 milhões de dólares por este passeio de uma semana. Digamos que ontem o espaço estava com tráfego acima do que é normal, 12 (astronautas e cosmonautas): 3 da Soyuz, 3 na ISS e mais 6 na nave Atlantis. Quando era mais novo recordo-me de uma série na TV "ODISSEIA NO ESPAÇO" (ou algo do género), a única diferença é que o enredo da série era em volta de uma estação lunar.